In summer days everyone is looking for drinks which are chilled and can easily relish your lost energy also quenching your thirst. Lassi is one of the popular drinks in India, it is made from curd. 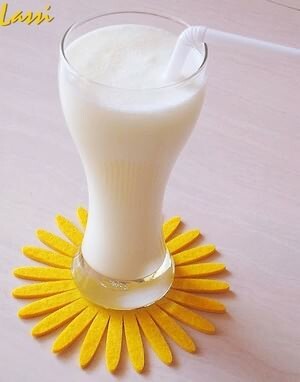 Lassi can be made either sweet or salty. Preferably in Punjab it is consumed with salts, as the saying go. In Punjab, no food is complete without a full glass of lassi. Here is the recipe of Lassi, with takes just two minutes and is loved by everyone including kids. * Some Rooh Afza or mint leaves for garnish. 1) First take a jug and pour the curd and add sugar to it. 2) Mix the curd and sugar either in a blender or with a mathni, spoon or which ever way you find it easy. 3) Do not over mix it, let it be a thick mixture, then add small amount of water about 1/2 glass see that the lassi doesn’t become dilute and the ratio of water should be 1/4 that curd. 4) Put some small amount of Rooh Afza on top of it for garnish, you can also put two mint leaves, add cashew nuts, or Pistachio (Pista),kismis along with few ice cubes and serve chilled.